Search engine optimization is a set of strategies used to promote certain content in search results. 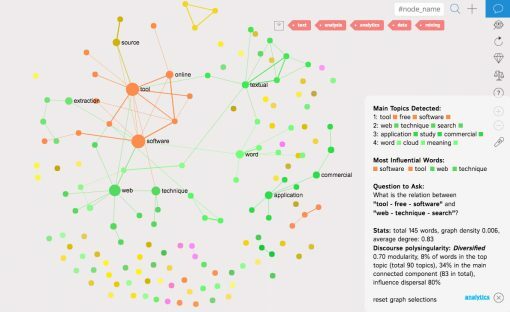 Using a combination of text mining and network visualization techniques, you can identify discrepancies between what the users search for and what they actually find. You can then create the content that bridges that gap, so that it’s shown at the top of the relevant search results. In this case study we explain the process step-by-step using InfraNodus text to network visualization tool. The first step is to identify the relevant search queries: what kind of audience we want to attract, what will they be searching for? How does it connect to our own work and interests and what our objectives are? In this case study we will focus on the notion of “text mining” as the people who search for these terms are very likely to be interested in Nodus Labs’ products and services (especially the tools to process and better understand textual data). 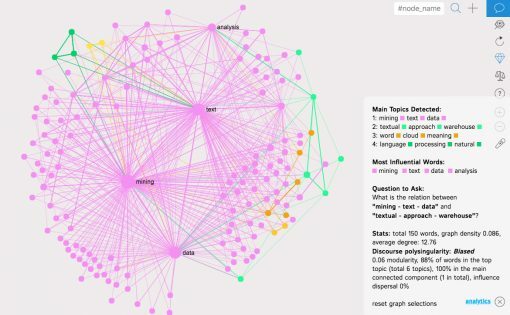 We want the people who search for anything related to “text mining” to visit NodusLabs.Com and to find out about the novel text network visualization tools they can use in their work. 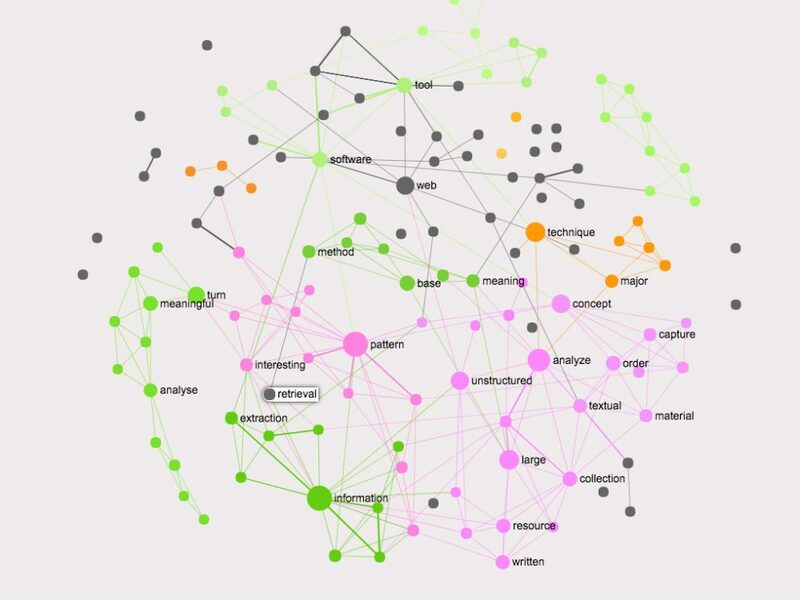 In order to do that we need to create the content on text mining and network analysis, however, we first need to identify the semantic field related to this query, so that we better know what the audience needs, what they already get in their search results, and what’s missing. The next step is to get a better understanding of the kind of content that people get when they search for “text mining”. In order to do that we can use InfraNodus Google import tool, which imports the first 40 search results for a certain query in Google and visualizes the most important topics and relations between them. The way the algorithm works is described in the paper on Visualization of Text’s Polysingularity Using Network Analysis. In short, the words are represented as the nodes and their co-occurrences are the connections between them. Once we represent the text as a graph in this way, we can identify the communities (contexts) of nodes (words) that are used more often together (topics) and the most influential words inside the text for meaning circulation (we use the measure of betweenness centrality, which shows how often a word appears between different contexts present within the textual data. So most of the content that is on the offer for this search query is related to processing large corpus of unstructured textual data and to discover patterns in this data. We now have an idea what kind of content people get when they search for “text mining”, so now let’s see what they actually search for. You can then click Download Keyword Ideas link in the Planner tool, which will create a CSV file. Open this CSV file in Google sheets, Open Office or Excel and copy the data in the first column, which lists all the different search queries and word combinations. When we remove these terms, we can see that when people search for something related to “text mining”, they often look for “free software tool” and “web techniques” that would allow them to do the process of data analysis. Compare it to the previous graph of the Google search results (from Step 2) and you will see that “software tools” and “techniques” were missing from what people see when they search for “text mining”. This analysis indicates that what people are looking for but what’s missing from search results in relation to “text mining” are some web-based retrieval applications and algorithm implementations that could be used for text data analysis. We now discovered a potential gap in what’s searched for and what is being found as well as an interesting commercial opportunity in the field of “text mining”. We have identified the current lack in the field of “text mining”, so we can now create content that will fulfil this lack and propose innovative solutions to the field. 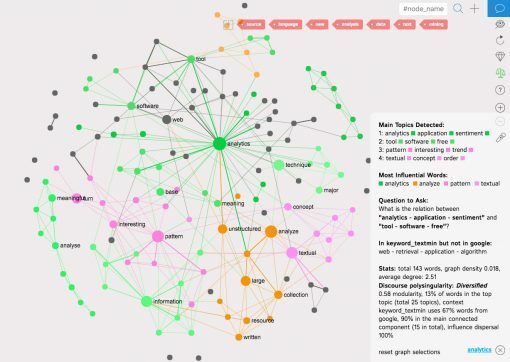 In our case we will be creating the content on “text mining” making a special emphasis on various software tools, including our own open source text to network visualization platform InfraNodus. This content will fulfil the current gap identified through analyzing search data on keywords, driving more users to NodusLabs.Com. 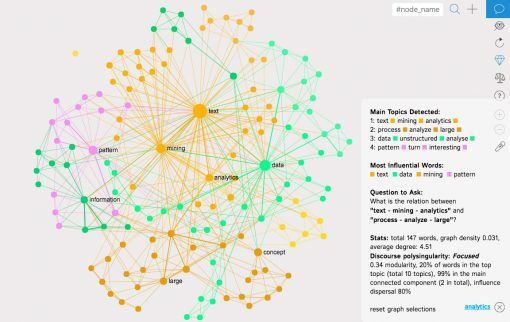 Those users can then choose to try InfraNodus tools in their own work to test out a new method for text mining using network analysis and visualization, and, in turn, supporting the further development of this project by contributions.